I am going to exercise my constitutional right to line item veto this ridiculous exercise in budget futility. 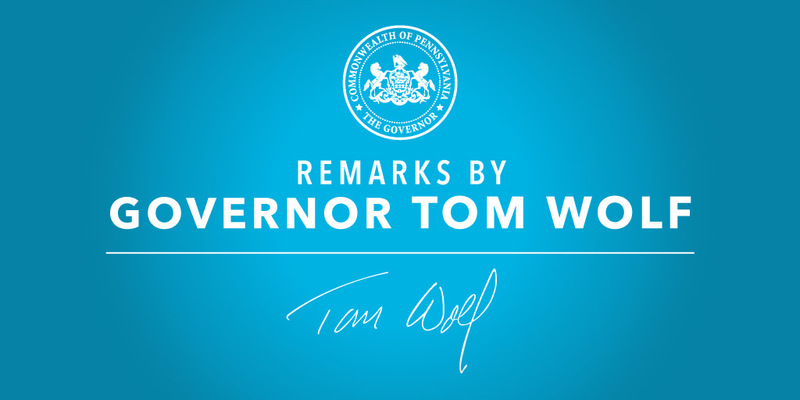 I’m calling on our legislators to get back to Harrisburg – back to the work they left unfinished last week. In the meantime I’m vetoing their $95 million cut to education. I’m also vetoing other items that they don’t pay for. At the same time, I’m allowing emergency funding for our schools to get out. I’m also letting funding go out to our human service agencies and to our counties. But this is on an emergency basis only. In doing this, I’m expressing the outrage that all of us should feel about the garbage the Republican legislative leaders have tried to dump on us. This budget is wrong for Pennsylvania. And our legislators – the folks we elected to serve us – need to own up to this. They need to do their jobs. This budget is wrong for so many reasons. First, it doesn’t balance. Even with the numbers presented to me by the Republicans before they ran out of town just before the Christmas holiday. This budget doesn’t add up. In fact it leaves a half a billion dollar hole for this year (2015-16). And a $2 billion hole for next year. There’s a reason why the outside rating agencies have downgraded our debt. They’re telling the world what our legislators want to ignore. Our fiscal house is a mess. Second, this pretend budget doesn’t make the investments a prudent state government should make, in things like education. This exercise in stupidity actually cuts education funding by $95 million compared to the draconian Corbett budgets. It does add a modest amount in basic education funding, but then it takes out over $300 million to be used for school construction. By the way, before they left town, our legislators also neglected to provide any funding for Penn State, University of Pittsburgh, Lincoln University, Temple, Penn School of Veterinary Science. The budget they concocted doesn’t have enough revenue to leave any room for doing anything to increase funding for our state universities over 2014-15 levels. This budget is doubly frustrating because we were so close to a reasonable one. I had worked patiently and persistently with Republican leaders over the past many months to agree on a compromise budget. That compromise budget was in balance. That compromise budget invested in our kids and our schools. That compromise budget also included historic pension reform and historic liquor reform. That compromise budget actually passed the Republican dominated Senate by a vote of 43-7. And it passed the House on a number of preliminary votes. Then, before the final vote, the Republican House leaders told their members to go home. I get it that everyone is tired of this stalemate But we were almost there. And this makes what they did all that much more unconscionable. They simply left town before finishing their jobs. They can deny what they did. They can try to justify what they did. They can throw around all the political nonsense they want, but the fact remains. They ran off – pretty quickly at that – before they finished their job. And they left us with a real holiday mess. Let’s not kid ourselves; we still need a budget. We need one that actually adds up, this year and next. We need one that fully funds the needs of our schools. We need one that really covers the cost of our state. We need to pass the budget that the Senate and House passed – Senate Bill 1073. And that I’m ready to sign. If we don’t get this right, we will face massive cuts to education and human services next year. And we’ll see huge increases in local taxes and massive additional cuts to our local schools. Remember 2011? We need to get this right. So, to the legislators elected to do the people’s business: let’s get back to work. Let’s get back to the work the people of Pennsylvania sent you here to do. Let’s get back to work to finish the job you almost finished last week. Read the press release on rejecting the Republican plan to cut education. Check out the Twitter Collection of the announcement.